***I received complimentary product samples in order to facilitate this post. No further compensation was provided, and all opinions remain unaltered and genuine. All photos below are property of Momma Told ME Blog 2013. Momma Told Me: Do it because it's good for you, not because it's fun. Training me to brush my teeth properly was not a hurdle for Momma. Armed with my hot pink Disney Princess toothbrush, and Scooby Doo blueberry toothpaste (if it sounds delicious, it was- healthy it likely was not), I'd happy scrub away at my growing teeth. When my adult chompers began pushing my baby chompers out of my mouth Momma informed me it was time to switch to an 'adult' toothpaste. I was immediately excited; anything 'adult' had to be awesome, right? The first time I stuck that pea sized dollop of Crest on my brand new Medium head toothbrush, I promptly spit it out. The excess of menthol, alcohol, and other strong sanitizing components actually burned my tongue! That was the day tooth-brushing became a chore, and a lifetime ware was waged. Both of my father's parents had full dentures installed in their early thirties; something my grandmother has long been embarrassed about- but, more importantly, something that has drilled (pun intended) the importance of great oral care into my head. I can't imagine having to put my teeth in every morning, or the torture of slowly having them pulled out, one by one. I can barely tolerate a routine teeth cleaning! Modern oral care is full of equally scary terms and images; teeth with exposed roots symbolize dental care, toothpastes boast the ability to 'kill' and annihilate bacteria, or prevent 'decay'. With all of these scary terms and signals,it's no wonder most adults left behind proper oral care with their Scooby Doo toothbrush days! That's precisely how Hello products were born; a very intelligent man saw the rise of singing toothbrushes for kids, but a lack of appealing oral care brands for their caretakers. And so Hello was imagined as a gimmick free, icky free (99% natural) oral care brand, with clean packaging and bold colors. They were not trying to re-imagine oral care, simply bring it a little closer to it's roots. 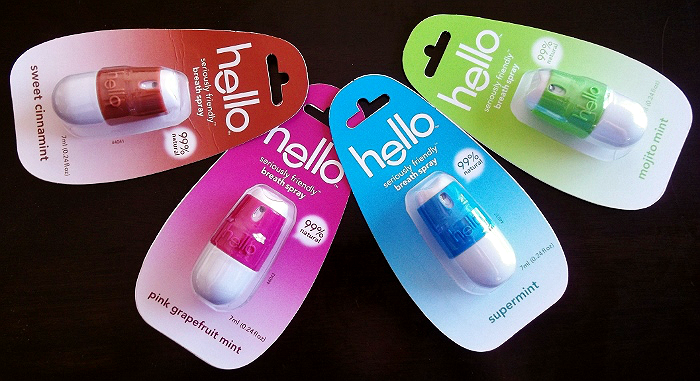 Featuring 99% natural toothpastes, mouth washes, and pocket size breath sprays in bold minty flavors like Pink Grapefruit Mint and Mojito Mint, Hello also offers colorful toothbrushes with handles made from 50% recycled materials. 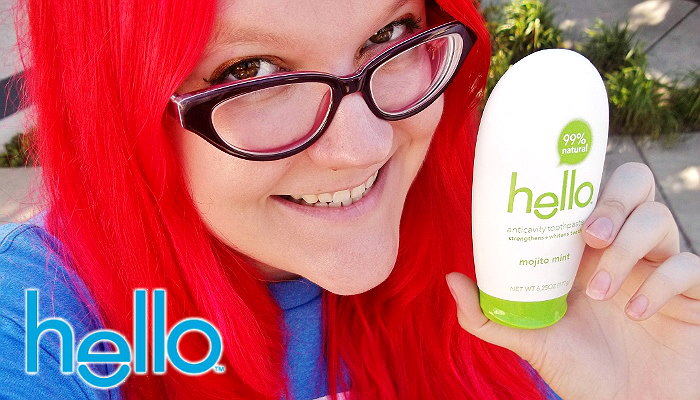 Sold in store exclusively at Duane Reade (and Walgreens) chains, as well as Target, and online at SOAP.com, Hello products are a refreshing addition to the intimidating oral care market. My first impression of this range of products was immediate love. Not only were the white handle brushes and white toothpaste tottles (tube/bottle combos) laced with colorful patches and bristles, but the packaging had witty little quips, and positive phrasing. 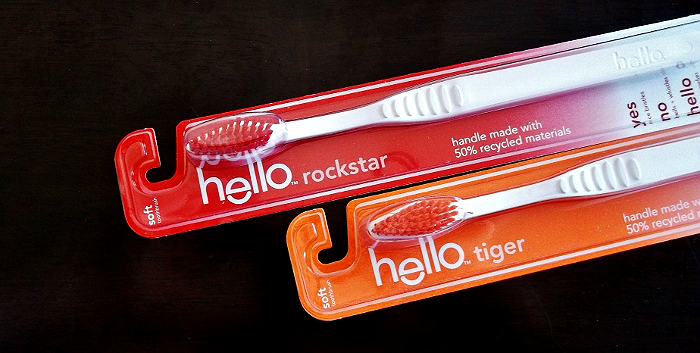 A juxtapose of the branding 'Hello' was followed by 'Rockstar' on my soft bristle toothbrush, and the breath spray claimed to be 'Seriously Friendly.' The packages are even void of the usual clutter of warnings and instructions. That's right, there are no instructions on the packages, but the brand's lawyer has advised they place them on the website for especially discriminating patrons. (You'll find them under the FAQ section.) Hello does, however, over a witty dosage guide for their mouthwash, online. If you've ever wondered how much to swig for your first day of clown apprenticeship, or eating egg salad flavored chips, they've got your back. Impressively, the products live up to the bold design and somewhat cocky lack of verbiage. For a 99% natural toothpaste, Hello strengthens and whitens through an anti-cavity flouride base that is neither chalky or with an aftertaste. A few of the flavors had me hesitant at first, but I quickly found Pink Grapefruit Mint to be a zesty start to my morning routine. While my Hello products toothbrush won't play me 2 minutes of music, to time my scrubbing, it's in-ordinary plain design is quite refreshing, and the soft head bristles left my mouth feeling positively fresh. While I didn't have a chance to experience the mouthwash, I was sent the range of Seriously Friendly Breath Spray, which dispensed small spray bursts of alcohol free, ouch free, flavored formula. Not only do I love how tiny these 2" dispensers are to stash in a purse or pocket, but I've enjoyed over 50 sprays of 'fresh' on my Cinnamint so far, and it keeps on going! 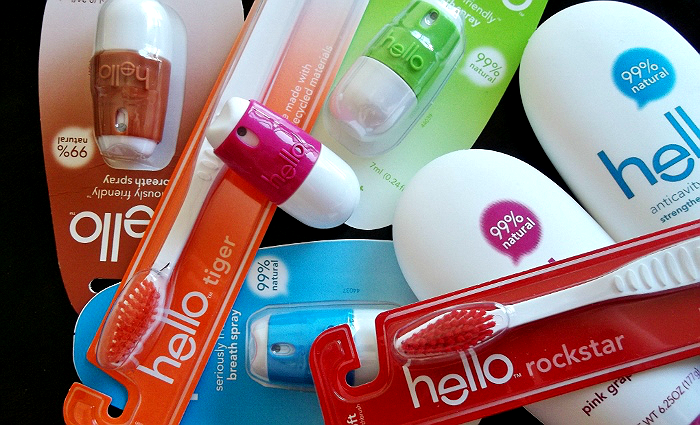 Hello products are a welcome reset to traditional oral care marketing. Not only is the product composition ouch-free and naturally friendly, but the packaging is thoughtfully designed for convenience. The no crumple tottles naturally sit on their cap, to allow gravity to dispense every last drop of product. The unique twist on minty flavors is also a nice throwback to the days of the gently flavored toothpaste of my childhood. Bravo! What Daughter Says: Fall in love with proper oral care again, with Hello products. One Momma Told Me reader will win a bundle of Hello products to try at home! I would love to try the toothpaste. I need something new and sometimes before bed, I don't like really minty flavors. I would really like to try the Pink Grapefruit toothpaste. :) Sounds yummy! I love going basic with things and this brand seems like something I would like.....if I can find it. I would like to try the cinnamint mouthwash. I want to try the Pink Grapefruit Mint. 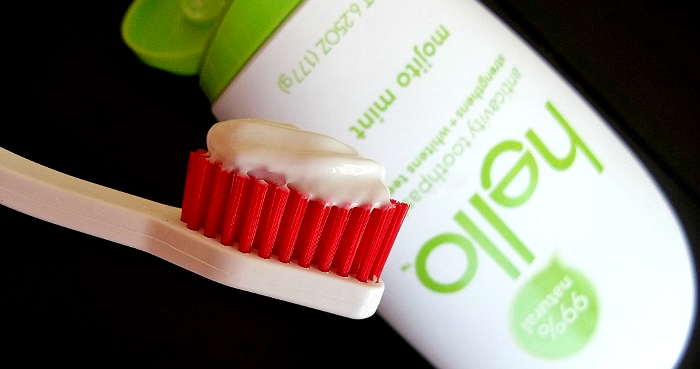 The Mojito Mint Toothpaste sounds delicious! Would like to try the pink grapefruit mint toothpaste! I'd like to try the toothpaste since it's 99% natural. I have trouble with all the chemicals in products. I would like to try the anticavity fluoride toothpaste. I'd most like to try the Supermint breathspray but even more so I hope to win this prize package for my sister Renee, she lives in a different state than me, and even though she is low income, natural healthy products are really important to her so I KNOW she would especially appreciate these! Thank you to blogger and Hello Sponsor for the opportunity. I'd most like to try the mouthwash. I think we would love to try the Mint breathe spray from Hello products, I also found out that Target sells it and I am going to check it out. I'd love to try the Pink Grapefruit Mint toothpaste. I would love to try the Mojito Mint Mouthwash. I want to try the Sweet Cinnamint toothpaste. I'd most like to try the Mouthwash - Supermint. Thanks. I want to try the mojito mint breath spray! The Supermint mouthwash sounds excellent as well as the Mojito Mint. I want to try the mojito mint toothpaste. Spearmint mouthwash -- love the classics! I'd love the Sweet Cinnamint toothpaste.